Clean and new with old, dirty and leaky hiding behind! Back in the summer of 2010 my trusty Chiruca boots began to let in water, and eventually with autumn approaching I was forced to look for a replacement as the ones I had were nowhere to be found on the infernal web. A great shame as they were ideal, and lasted well with no TLC. I did some investigating and came up with what looked to be a good alternative. I even managed to find a local supplier and go try them out. They were really comfy and looked as well made as the Chirucas. I was assured that they were fully waterproof, despite the gusseted tongue not being made of leather. Less than twelve months later they were cracking and letting in water - not just through the cracks but through the 'waterproof' tongue. This winter they were not only useless for paddling, they also let in water when walking through heavily dew-laden grass. A bunny filled with joy I was not. 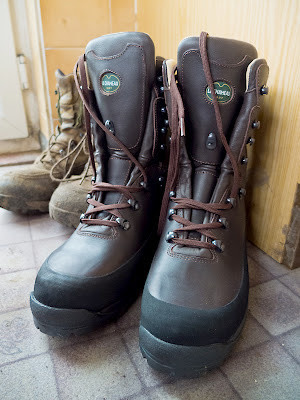 I decided to ask for recommendations on The Pikers Pit and the boots that got the most kudos were Le Chameau Mouflons. I resisted buying off the web, and today I stopped by a local stockist to inspect a pair. I'm glad I did, because the size I have always found to fit me well in all other boots proved to be rather too snug. First impressions are good. But they were of the leaky pair. If these boots don't stand up to my neglect I'll be seeking retribution on The Pit!